By summer solstice the last of the corn planting has occurred, the crops are growing, the Katsinam have finished their role in supporting growth for the year. Also at this time many brides of the season grind corn with their mother-in law’s family and are presented in the plaza wearing the white wedding robe woven by the male relatives of the groom. There is growing interest at Hopi in installing orchards, edible shrubs, herbs, and kitchen garden projects using low water drip systems and permaculture design-with-nature practices to create more local food supply and healthier diet. Many Hopis still practice traditional dry-farming of corn, beans and squash in the central village areas below the mesas. Moencopi villages farmers (to the far west where spring water is available) irrigate field crops. We are supporting back yard and group projects taught by knowledgable Hopi and regional gardeners where water is available for low water drip system supported agriculture. The goal is for each project to become a viable food-producing installation and a learning opportunity for other Hopis. Since 2014 we have been providing support for a Hopi youth group at Second Mesa which is called Natwanhoyum Tunatya (means teach and farm together for the future). The coordinators will also “Share core values from our Elders and Kiva teachings of Hopi character and identity that one must practice to be a good person, such as respect for all life, work hard” and much more. Please see eloquent statement of their values they have given us permission to post on our website here. Just 3 weeks ago, we provided plants, soil nutrients and supplies for the installation of their drip-system supported orchard-vines-herbs garden adjacent to the dry farm area of their coordinators. Sedona orchardist Mario Valeruz provided expert guidance with the planting. These young boys worked hard and loved being out there together learning (many do not have fathers who are farming to teach them). + fund a demonstration orchard-garden back yard project at Mishongnovi for a family willing to share this wisdom with other Hopis. Grape vine planting (photo by Mario Valeruz). This is the dry farm area below the mesa, but they are near a solar-powered well and can install a mulched drip-tape system. 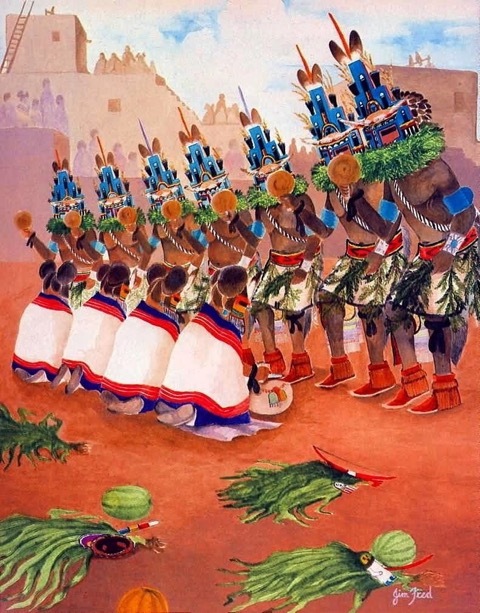 We maintain close contact with Hopi members of our circle who advise us on needs and each year since 1999 we have evolved our projects based on their input, annual review of what has been effective, and donations coming in. We coordinate with Hopi service providers and families, outside resource providers and our supporters. We and our Hopi friends are grateful for the support of our volunteers and donors who have made it possible to grow each year. We are working with Hopi skilled builders/repairmen along with homeowner volunteer labor (and training in home maintenance) to address leaking roof, sanitation, and a myriad of other challenges as we have funds available. We just finished Phase 1 of old Hopi Housing Project home at Polacca with leaking roof, worn out kitchen, a myriad of plumbing and electrical malfunctions and a smoking chimney bringing toxic coal fumes into the home. Our Hopi contractor used very thrifty shopping and gave unpaid hours to get this place functioning. The family members helped and are continuing painting and other projects on their own. We are assisting a Second Mesa Hopi family to finish a room which will allow installation of a fresh and grey water system (tanks adjacent to home filled and emptied by hand), shower and kitchen to their one-room home on top of Second Mesa. The village has no sewer or water. This home is part of the traditional ceremonial cycle of the village. We provided a handicap ramp and alterative toilet and have begun work on the kitchen/shower addition. We welcome donations that will make it possible to install kitchen, shower and water tanks for Phase 1. Phase 2 will be to rebuild the two rooms by the plaza where the stone walls have collapsed. We also envision having a budget to do emergency repairs (especially for health and sanitation situations) for people who have no other support from the tribe or family.